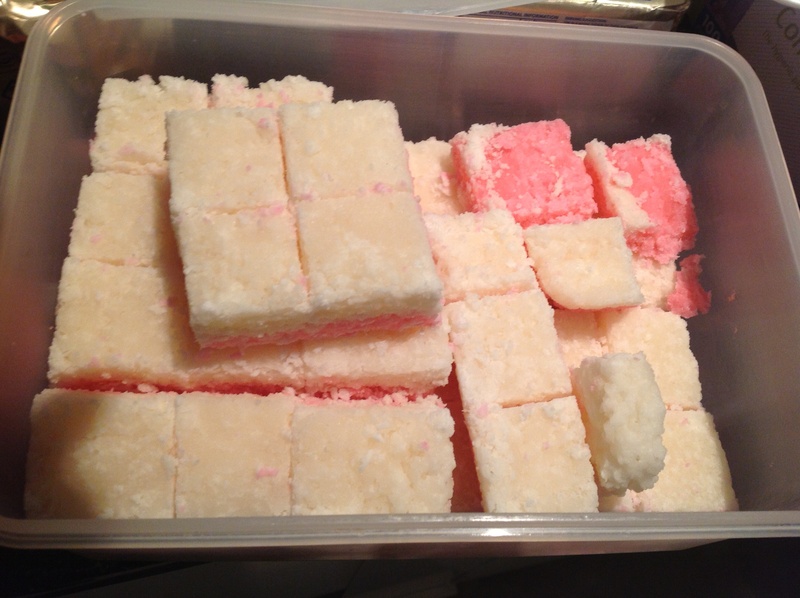 Who knew making coconut ice could be such a challenge! My mother graciously volunteered to show me how to make it, since her recipes tend to be a dash of this, a pinch of that, just a handful and she would say “you know”…no I don’t know, so the purpose was to measure her vague measurements and understand temperature to know when the consistency was right, since I had never made it before! And she stated emphatically this was easier than making fudge! Hmmm…well easier said than done. My mother had not made this in years i.e. since we were kids, so first attempt didn’t work. Hmmm….second attempt didn’t work – it got so bad, it reverted back into crumbs, by cooking it too far! First attempt was put back on stove….and we thought it would set. Not. Third attempt, and finally we struck “coconut-ice”. So not for the faint-hearted, but it is a far simpler recipe than fudge and as not as tedious in the amount of time taken to make it nor how long you have to stir! Mix all the ingredients in a thick-bottom saucepan/pot on the stove. Ensure you keep stirring continuously, when the mixture gets to a boil, keep it at a boil and stir for approximately 7-8 minutes. Tip: to make pink, simply add a drop of red coloring or pink colouring. Finally, thank you mom for your patience in trying, and retrying until we got it right!!! This entry was posted in Baking as easy as 1..2..3 and tagged coconut fine, coconut grated, coconut ice, milk, sugar by angelb38. Bookmark the permalink.